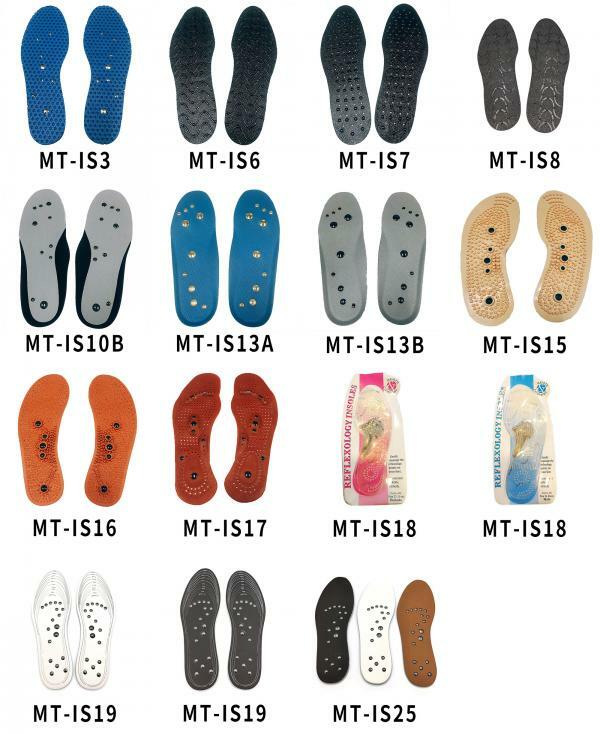 Magnetic Insoles includes material of PVC, PU, EVA and Flexiable Rubber Magnetic sheet. There are size S & L for MT-IS1, MT-IS3, MT-IS6 & MT-IS7. One size fits all for MT-IS2, MT-IS4 & MT-IS5. Flexible Rubber Magnetic Sheet: MT-IS4, MT-IS6 & MT-IS7. 16 Bio-Magnets for MT-IS1, MT-IS2 & MT-IS3. Flexible Rubber Magnetic Sheet for MT-IS4, MT-IS6 & MT-IS7. Around 550 +- 50 gauss for MT-IS1, MT-IS2, MT-IS3 & MT-IS5. Around 450 +- 50 gauss for MT-IS4, MT-IS6 & MT-IS7. Special insole cofiguration stimulates reflex points on the soles of your feet. Rugged surface massages the soles of your feet while you walk. The invigorating effect of the Health Insole has to do with the reflex points in the feet that lead to all parts of the body. When these points are stimulated through massage, your whole body feels better.